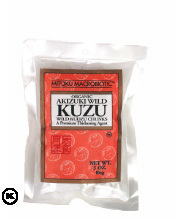 Natural Import Company - Traditional Japanese foods - Mitoku Akizuki Wild Kuzu - 3 oz. Mitoku Akizuki Wild Kuzu - 3 oz. Ingredients: Handcrafted Akizuki 100% wild Japanese organic kuzu root. Unbleached. The town of Akizuki is blessed with an abundance of pure water and a cold dry winter, ideal for processing kuzu. Kuzu is a special starch derived from the roots of one of Japan's most tenacious and vigorous wild plants. Here, for 5 generations, the Hirohachido family has been making some of the finest kuzu in all Japan. Mitoku Wild Akizuki Kuzu is handwashed over 100 times, which makes it distinct from our Organic brand, and produces a very unique, top quality product. Use Mitoku Akizuki Wild Kuzu to thicken sauces, soups, and broth, puddings and pie fillings.